Learning prosocial behavior is one of the hallmarks of cognitive development. Young children sometimes behave in a self-centered manner due to behavioral immaturity. Over time they learn how to communicate and interact with others. During the adolescent transition period from childhood to adulthood, social interactions become more complex, as children move into larger schools and organizations. Prosocial behavior (PB), defined as “voluntary behavior intended to benefit another”, is the key to these challenging circumstances, and it occurs during the peripubertal period when extensive connections between brain regions are occurring. Now, researchers have discovered a key connection that may play a role in the development of prosocial behavior in pre-teen children and how the brain’s chemical balance assists this wiring. To identify prosocial-related brain connections, Dr. Naohiro Okada and Prof. Kiyoto Kasai of the International Research Center for Neurointelligence (IRCN) and Department of Neuropsychiatry, Graduate School of Medicine, the University of Tokyo, and their colleagues in a multi-institute consortium, decided to focus on the adolescent brain with advanced neuroimaging techniques. Around two to three hundred participants for brain imaging were recruited from a large-scale ongoing study, the “Tokyo TEEN Cohort” (TTC; http://ttcp.umin.jp/) involving 3,171 early adolescents in the Tokyo area. This approach, called “population neuroscience”, can reduce selection biases based on laboratory deviations. Where in the brain to look? Earlier reports indicated that the medial prefrontal cortex (mPFC), including the anterior cingulate cortex (ACC), is involved in adolescent maturation of social cognition but the contribution of its functional network was unknown. The authors used a brain imaging method called resting-state functional magnetic resonance imaging (rs-fMRI) that can reveal how baseline brain activity reflects neural network structure. Using this technique, they revealed that the strength of connection between the right ACC and middle/posterior cingulate cortex (MCC/PCC) positively correlated with prosocial behavior assessed in a questionnaire (sample 187; Figure 1). Further measurement of brain chemicals by magnetic resonance spectroscopy (MRS) demonstrated a negative relationship in the ACC between prosocial behavior and the concentration of gamma-aminobutyric acid (GABA), a neurotransmitter that principally inhibits neural activity (sample 221; Figure 2). This study is the first to demonstrate a brain circuit that supports prosocial behavior in early adolescents. The right ACC to MCC/PCC connection may be related to the development of social support and empathy. Moreover, the findings also show how specific neurotransmitter levels may support the development of brain connectivity and their related cognitive functions. The results suggest that in early adolescence, GABA levels in the ACC might constrain the development of prosocial behavior by suppressing the connection with the MCC/PCC. These findings will contribute to a better understanding of how critical the early adolescent period is for the development of social cognition. They also demonstrate that the healthy maturation of neural circuits in the adolescent brain may promote individual well-being in adult life. Media Contact: The author is available for interviews in English. Assistant Professor Naohiro Okada, M.D., Ph. D.
Professor Kiyoto Kasai, M.D., Ph.D. Brain region analyses indicating that resting state brain activity in the right anterior cingulate cortex (rACC) is positively correlated with prosociality are indicated in yellow. 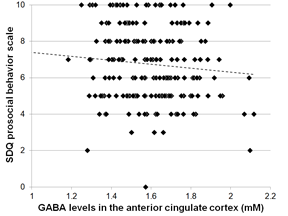 GABA concentrations in the ACC negatively correlated with the SDQ prosocial behaviors scores. SDQ is a behavioral questionnaire to assess behavioral tendencies.